Digitization throughout the entire product lifecycle accelerates the development and production of complex industrial products while improving product quality and functionality. However, the increasing connectivity of (critical) cyber-physical objects, which goes hand in hand with digitization, also leads to new security requirements, which can only be solved insufficiently with existing methods. 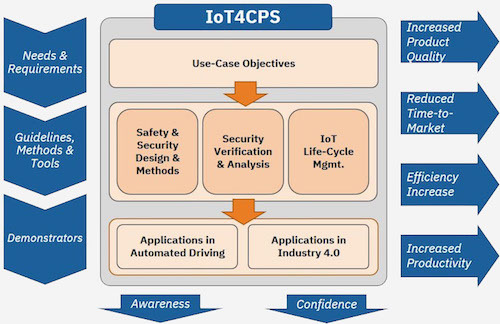 The IoT4CPS project aims to develop guidelines, methods and tools for secure IoT-based applications in the areas of Connected & Autonomous Vehicles and Industry 4.0. IoT4CPS focuses on the development, production and operation of safe components and applications for connected and autonomous vehicles. In this area, IoT4CPS addresses the entire value-chain from semiconductors and control systems to applications. Since the design and manufacture of the components required for connected vehicles requires a high degree of integration and information exchange, the methods and tools examined are also very relevant in the context of Industry 4.0.